Línea Directa Host, Arturo Salcedo, on the set of the public service television series, which is now being videotaped in the studios of NBC4 (1990). “Linea Directa,” the Washington area’s longest-running Spanish language public education show, debuts tomorrow on a new television station, in a new time slot and with a new, more upscale look. Its mission, however, is unchanged. The target audience, said Arturo Salcedo Martinez, the show’s host, is still new or recent immigrants from Latin America who face obstacles because of language barriers and immigration status. The program’s goal is to provide immigrants with information on their rights as well as on health, legal, social services and educational issues. “They come here because they want to improve their lives, and they’re doing the best they can,” said Salcedo, 41, who emigrated from Colombia in 1984. A decade ago, when “Linea Directa” began as a monthly television program, the show concentrated on explaining the area’s 911 emergency telephone service and the importance of participating in the U.S. Census–even going through the survey question by question for viewers. Since then, the Latino community in the metropolitan region has grown to an estimated 400,000. It has evolved and matured and is facing more systemic problems of adjusting to life in the United States, the show’s producers say. These days, “Linea Directa” discusses topics such as the academic gap between Latino students and their white, African American and Asian American counterparts, and what Hispanic parents can do to help bridge that chasm. The program also has explored the future of the Latino community in terms of the presidential election, the devastating prevalence of domestic violence in Latino households and the problem of racism between light-skinned and dark-skinned Latinos. “We have to discuss serious issues, but on another level,” Salcedo said. The new home of “Linea Directa” is on the local Telemundo affiliate, WZDC-TV, which broadcasts in the District on Channel 64, and cable channels 34 (for those with digital service from District Cable) and 77 (Starpower Communications). The show also can be seen in Fairfax, Arlington, Prince George’s and Montgomery counties, and in Alexandria and Fredericksburg. Starting tomorrow, the show will air at 6 p.m. Fridays, with a rebroadcast at 9:30 a.m. Sundays. “Linea Directa” is the first Spanish-language program to enter into a permanent public service partnership with a major news organization, WRC-TV (Channel 4), the NBC affiliate in Washington. The station is providing “Linea Directa” with technical personnel and state-of-the-art studio facilities where the weekly series is videotaped. At a recent taping of “Linea Directa,” in WRC’s studios in Northwest Washington, Salcedo and his guests met on a sleek set with five cameras, four of them handled by a robotics operator, a cameraman, an audio technician and a stage manager. Down the hall in the control room, executive producer Eduardo Lopez watched the taping with a director and technical director in front of a wall of television monitors. An audio specialist worked in the room next to them. The tape was edited and ready for airing within hours. Quite a change from the days, not so long ago, when “Linea Directa” was run on a shoestring budget. Until this summer–and for the past five years–Salcedo and Lopez produced the program by themselves out of a basement at St. Paul’s College in Northeast Washington. Their makeshift studio was in a roped-off area with a black curtain. There was one camera, mounted on a tripod, fixed on the set. Lopez pushed another camera on a dolly track to focus in on Salcedo, then focus out on the guests–giving the illusion that three cameras were at work. The host and guests sat on beat-up wooden chairs. It took Lopez two or three days to set up the show and, working alone, almost a week to edit it. Salcedo and Lopez have worked together since 1986 when they were city employees of the Mayor’s Office of Latino Affairs. They saw a need to educate the Latino community, Lopez said, and produced Spanish-language public service announcements about such topics as preventing fires and an immigrant child’s right to enroll in public school regardless of legal status. By 1989, the two men had created “Linea Directa,” which first aired Jan. 25, 1990. District Cable donated the use of its studio facilities. The program was broadcast monthly on District Cable’s Channel 16 and on the local affiliate of the Spanish-language network Univision. Dramatizations–which mimicked to a certain extent the popular Spanish-language telenovelas, or soap operas–were used to drive home educational messages about such subjects as the dangers of drinking and driving, teen pregnancy and how to deal with police officers and the U.S. judicial system. 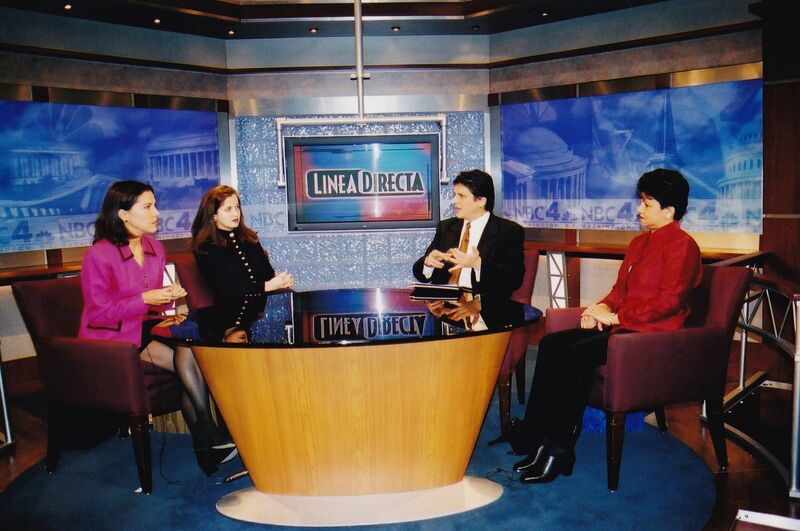 In 1994, Salcedo and Lopez lost their jobs in the Office of Latino Affairs because of budget cuts, and “Linea Directa” lost its D.C. government funding and went off the air. Determined to keep the show alive, the two formed a nonprofit corporation called Educational Videos in Spanish (now EVSCommunications) and sought grants to support the program. It went back on the air in August 1995, buying broadcast time on Univision. To remind him of the impact “Linea Directa” has had on viewers, Salcedo keeps three crumpled dollar bills that a Salvadoran woman gave him years ago to help support the show. She recognized Salcedo in a restaurant and told him that her son’s life had been saved because the one-time heavy drinker watched a program about the criminal consequences of driving drunk in the United States.